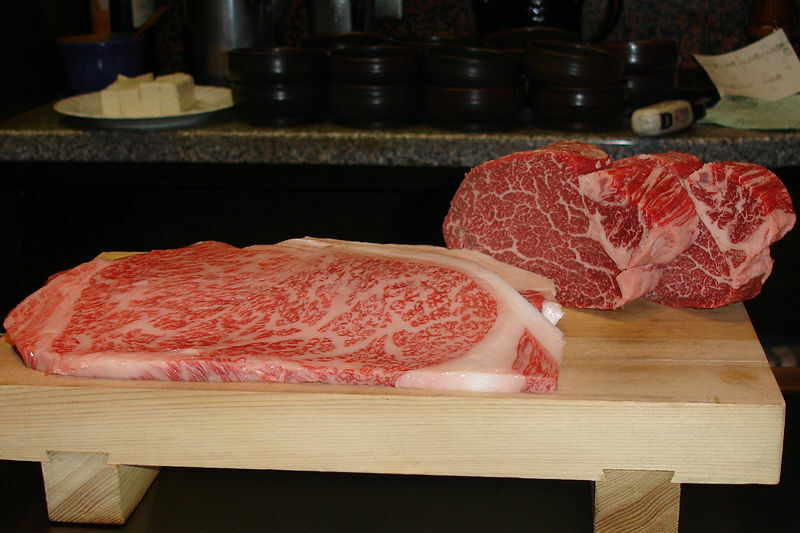 When one thinks of good quality beef, the first thing that comes to mind is probably Kobe beef. Kobe beef, which comes from cows that were born and raised in Hyogo prefecture, is highly prized for its exquisite flavor and marbled fat. These days it’s virtually impossible to walk in to any good restaurant in any part of the world without seeing Kobe beef on the menu. Kobe beef burgers are still all the rage at most gourmet burger joints and restaurants in the US. However, it’s important to make the distinction of true Kobe beef and Kobe-style beef. True Kobe beef comes from Japan, and the cows are raised in a very specific manner. Every day they’re massaged by hand with an exorbitant sake rub, fed a bottle of beer, taken for regular walks, and lovingly brushed and caressed by their caretakers. They’re treated better than the average human (until they’re slaughtered, of course). Kobe-style beef comes from cows that are domestically raised in the US, and they don’t get nearly the same amount of love and attention as their genuine counterparts. In Japan, Kobe beef is very popular and praised for its high quality, but it’s not the holy grail. 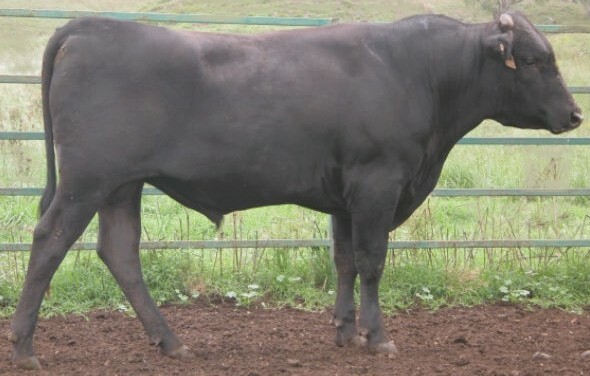 In Japan there are many more types of exquisite cattle that are even better than Kobe-gyu (gyu means beef in Japanese). Perhaps you have heard of Matsuzaka-gyu and Yonezawa-gyu, which are just as popular and famous, and are similarly raised with great care and effort. Classical music is sometimes played in these farms, as it is believed that happy relaxed cows make tastier beef. Numerous other brands of beef exist in all prefectures of Japan, such as Ishigaki-gyu, Iga-gyu, Yamagata-gyu, Saga-gyu, Maezawa-gyu, Hida-gyu and Konoe-gyu just to name a few. If you travel to any countryside in Japan, you’ll likely be able to find an exclusive and rare brand of beef, raised by a solo farmer, that’s worthy of competing against Kobe beef. According to the Japanese beef quality grading system, only 3 types of beef make the top cut, and Kobe beef isn’t on the list. If you want to see what these special cows taste like, you’ve got to travel to Japan. There’s really no other country in the world where the unprecedented quality of the beef exceeds anything beyond your wildest imagination. There’s one restaurant in Tokyo, a very noble and well respected establishment, that is debated to serve the best steak in the country. 43 years ago Aragawa took up a small restaurant space in the basement of a nondescript office building in Shimbashi. Since then, it has established a reputation for being the best steak house in the country, as well as notoriety for being the most expensive. The restaurant was opened by owner Akira Kazama, who spent numerous years studying and tasting all of the different brands of beef from Hyogo prefecture. He decided to open Aragawa when he finally met his dream bovine, the Sanda-gyu　三田牛. When I first visited this restaurant 5 years ago in its original location (and frankly shady location, as it was right next to a karaoke snack pub on an otherwise deserted basement hallway), I was blown away by the unmeasurable sweetness and juiciness of the steak. 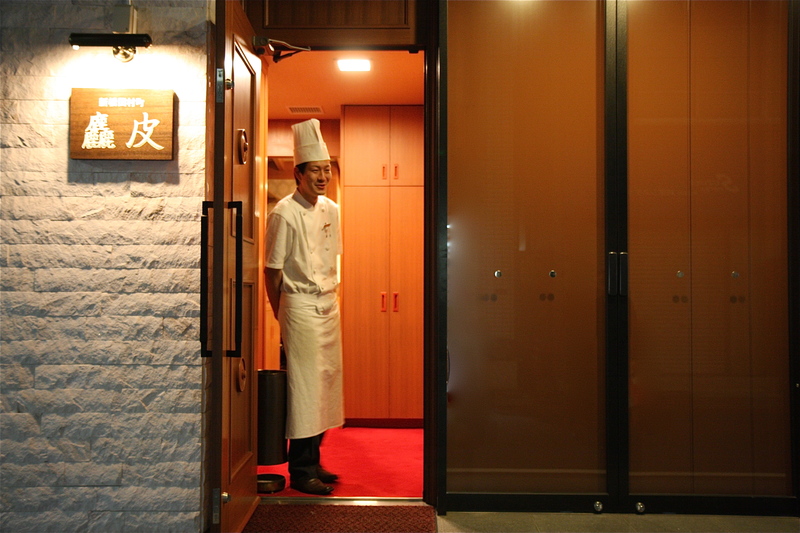 I was excited to revisit Aragawa on my recent visit back home, especially after finding out that it won a Michelin star. Thankfully, Aragawa has moved into a new location in Onarimon. The restaurant is on the street level now, and has a more fitting beautiful exterior that reflects its distinguished reputation. Once I opened the large wooden door, it was like stepping into a movie set from The Titanic. The decor was still the same, in old world aristocratic style with velvet carpets, antique wooden chairs, plush silk embroidered sofas and fine bone china perfectly laid out on the crisp white linen tablecloths. 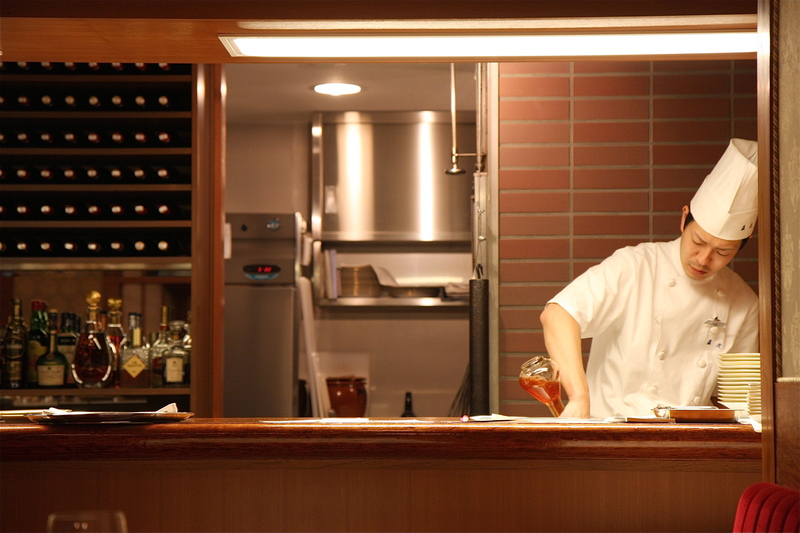 Chefs in the open kitchen wearing tall white hats greeted us with a smile, as the tuxedo clad maitre d’ with slicked back hair bowed down to waist level in an honoring Japanese welcome. Like the previous space, there were only 6 tables here in this exclusive restaurant, and as always, it was a full night. 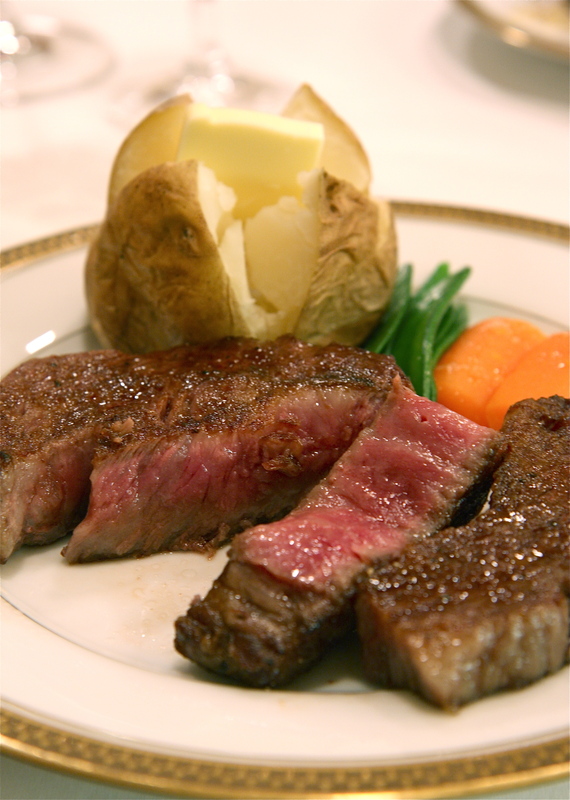 Aragawa offers one steak course. There is no written menu, and the chef’s selections for the day are recited by the waitstaff. You are allowed to select 2 seafood appetizers from a choice of 4 or 5, which is then followed by the house salad, the steak dish, and coffee or tea. It’s a straightforward, simple no-fuss menu that flaunts supreme ingredients and flawless preparation. 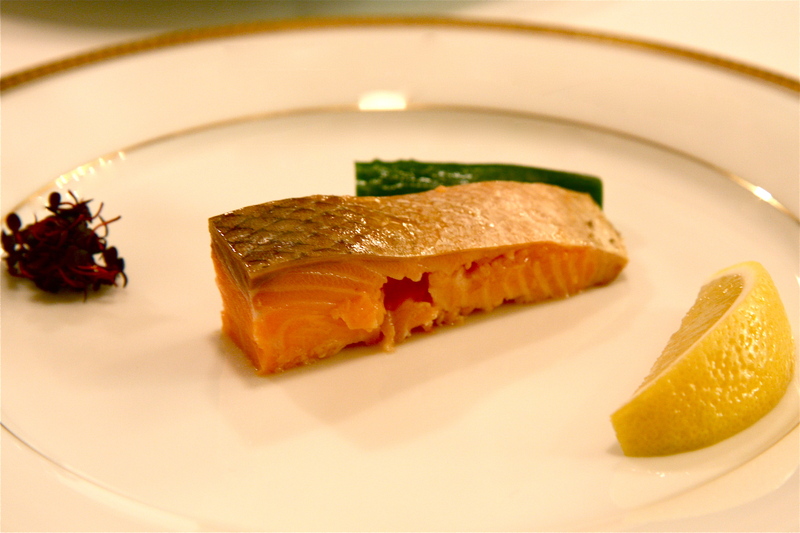 We started with the house specialty, the Aragawa smoked salmon. I had this on my previous visit, and it was the most exquisite and divine piece of smoked salmon that I have ever had in my life. They always use domestic wild salmon, and its origins vary from season to season depending on where they can find the best quality for this dish. This tender piece of king salmon from Laosu Hokkaido, was practically dripping in fatty juices and it had the perfect amount of smoky flavor. Unlike traditional and commercial thinly sliced smoked salmon, this thick cut of salmon, in all its flesh and skin, was truly a magical and incomparable dish. For the second seafood appetizer course, my dining companions had the poached Hokkaido sea scallop with beurre blanc. It was around this time that our bottle of wine arrived at our table. The wine list here at Aragawa was a compilation of the ‘Best of’. Only the finest wines in the world would be appropriate to complement the finest cut of beef, and I was amazed at all of the distinguished pedigrees that I was seeing on the 5 page wine menu. 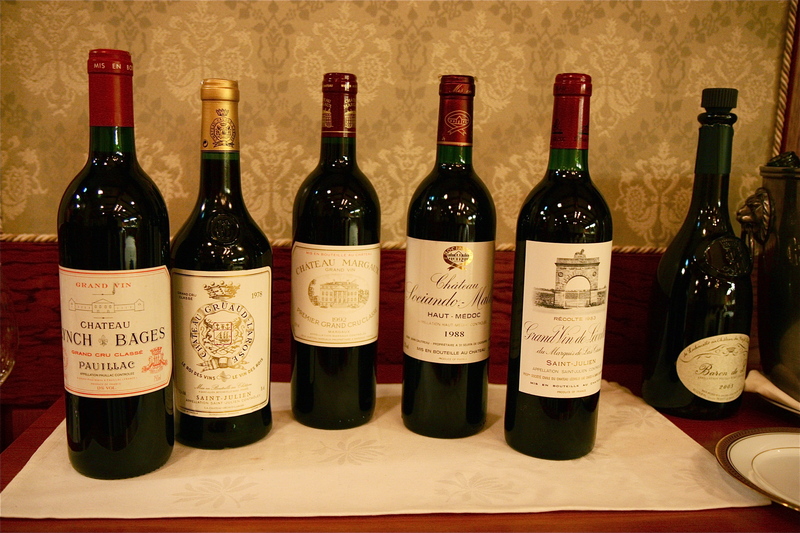 Haut Brion, St-Émilion and Lynch Bages stood out in the Bordeaux dominant line up, and we chose a 1995 Château Canon La Gaffelière Saint-Émilion. This divine bottle of wine, with silky tannins and a hint of dark berry undertones, was a superb choice for our meal. 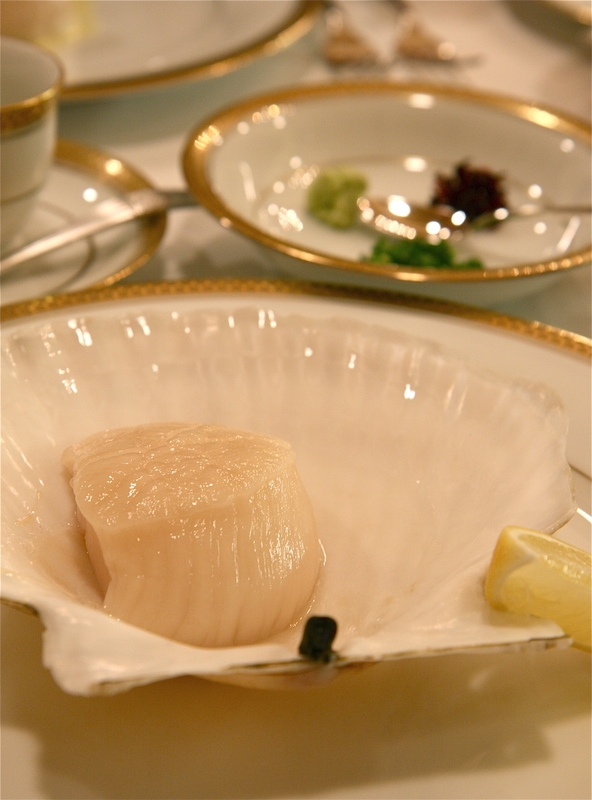 For my second seafood appetizer, I passed on the tiger prawns and hairy crab, and went for the fresh Hokkaido scallop that was quickly salt cured in its shell. The moist white adductor muscle flesh, virtually raw and extremely tender, was still attached to the shell. It was served with an assortment of pancultural condiments, which included lemon, wasabi, chopped scallions, soy sauce, red shiso leaves and cocktail sauce. This fresh hunk of scallop was already delicious on its own, and I enjoyed it most with a simple squeeze of citrus. Normally when you go to a chop house, they will ask you what cut of beef you want and how you would like it cooked- well done, medium or rare. Here at Aragawa no such questions are asked. They’ve already done the choosing for you, and they serve you their choice cut for the day with full confidence. The cut of choice may change depending on the condition of the Sanda-gyu cows, but it’s usually a sirloin, cooked medium rare. Given that they only raise a cattle of less than 1000 cows a year, this prized meat is a rare treasure. The meat was grilled in a special brick oven heated with binchō-tan, a high quality Japanese charcoal made from oak in the Wakayama prefecture, and seasoned with only salt and pepper to enhance the natural flavors of the beef. The sirloin was cooked to perfection, with a smoky sear on the surface and a glistening color of medium rare red in the center. The knife simply fell through the tender meat fibers down to the porcelain plate, and it was like cutting through air. With each bite, a squirt of warm savory juice filled my oral cavity with a luscious aromatic veil, while the marbled fat permeated my taste buds with a light and sweet flavor. This fatty cut of meat wasn’t heavy at all, and I finished this 200 gram portion of Sanda-gyu without feeling its physical weight in my stomach. Words cannot describe how incredible this steak was. I was glad that I made this return trip to Aragawa for the Sanda-gyu steak. I can honestly say that it’s the best steak that I’ve ever had in my life, and probably will ever have had in my life. The best things in life don’t come for free though. You’re probably wondering how much this decadent steak feast cost. Let’s just say that it’s probably the most expensive piece of meat in the world…but it was worth every yen.